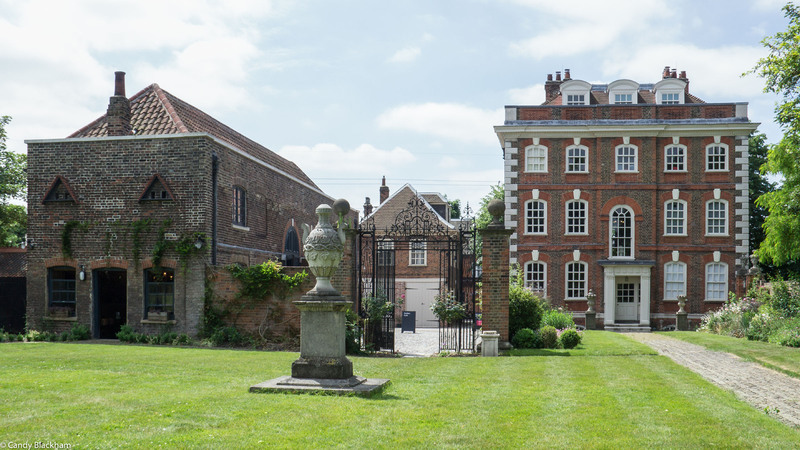 Rainham Hall is an early C18th house built for Captain John Harle, set in a pleasant garden, although it once had larger grounds. It retains fine wrought-iron railings and gates, the latter having the intertwined initials of John Harle and his wife Mary. The house remained in his family until 1895 but then fell into decay, although remnants of the Harles' formal garden layout remained. The house was purchased by Colonel Mulliner in 1920 who found it an excellent example of its period, and it was later given to the National Trust. Rainham Hall was built in c.1729 for Captain John Harle close to Rainham Church of St Helen and St Giles (q.v.). Harle, a master mariner, merchant and ship-owner from Newcastle had married Mary Tibbington in 1718, a wealthy widow from Stepney. This gave him sufficient resources to dredge the River Ingrebourne, which enabled trading vessels to come from the Thames to Rainham village. There was much call for building and other materials at that time as London was still being rebuilt after the Great Fire. Harle's own business flourished and he was able to build their new house at Rainham, in the Dutch style that was then fashionable. While the house was being built it is possible that the Harles lived in the Lodge, which was later used by his business foreman. A stable block and coach house stand behind the Lodge. Harle reputedly had the house constructed in high-quality building materials, as a showcase for the products that he sold as a merchant. The wrought iron railings and gates were restored in 1984/85 and have been described as ‘among the best work of the London smiths of the time’ and may be the work of Jean Tijou. The gateway has the intertwined initials of John Harle and his wife Mary, H J M. The grounds formerly included an adjacent field known as the 'Captain's Field'. John Harle died in 1742 and is buried in Rainham Church. His second wife survived him and members of her family stayed in possession of the house until 1895. Rainham Hall was then purchased by Revd. Nicholas Brady, but by 1920, when historian Colonel Mulliner bought it, the house was falling into decay. Mulliner was desirous to ‘possess it in order that so excellent an example of the period which most interests him should be preserved by careful and conservative reparation'. Much of the layout described in 1920 survives, including traces of herringbone stone paths and some ornamental stonework, although some paths have disappeared under grass. Fruit and nut trees in the wooded area include an immense mulberry tree. A Victorian doghouse can still be seen with space for three Dalmatians, ‘very necessary defences for the owners’ coaches against highwaymen’.